Traditional Russian folklore designs are back in style: Porsches around Moscow painted with motifs from Russian lacquer boxes, people sporting clothes with tapestry-work designs, and kitchen fridges painted with blue Gzhel porcelain patterns. Now and then you can see a Moscow trolleybus that has been decked out in colors copied from 19th-century Russian Gzhel porcelain. Still, even these pale in comparison to the visual appeal of public bathrooms painted in the red-gold-and-black color scheme of traditional Russian Khokhloma lacquer-work. These kinds of traditional designs could be spotted even in the 1990s, spray-painted onto motorbikes and such. However, their current mass appeal is something that has only appeared over the last few years. More and more girls around Moscow are wearing “Russian-style” dresses, cheating the stereotype that they are “for babushkas only.” Even major international stars like Gwen Stefani have become enamored with dresses from small Russian towns such as Pavlovsky Posad. Gzhel porcelain is an old Russian craft that originated in the 16th century. The patterns are characteristically cobalt-blue designs on a white background. The name originates from a small village in the Moscow metropolitan area that produces ceramics. The traditional subjects of Gzhel porcelain were birds and flowers. Khokhloma lacquer-work is multicolored lacquered wooden tableware. It has always been more popular with Russian people than Gzhel. It received its name from Khokhloma — a large trading settlement in the Nizhny Novgorod region. Despite the enormous variety of patterns in old Russian designs, the current trend in Russian fashion centers primarily on just two traditions: Khokhloma-style lacquer-work and Gzhel porcelain. People generally say the idea of valuing the good old days was first advanced by Russian designer Denis Simachev in 2007, when he released his spring/summer collection. However, it is unlikely the designer expected the patterns to then turn up on public transport and in public restrooms. It all began very innocently, with limited-edition Khokhloma iPhones and people spray-painting the patterns on their own Porsches or Ducattis. Denis Simachev has even gone into decorating fridges with his signature patterns. “Sure, you can buy a white fridge, but how boring is that? Instead, you can buy a Khokhloma fridge! And it’s patriotic too. It’s up to you — you can be boring, or you can be patriotic!” says Simachev. We spoke to people who have decked out their cars, clothes or mobile phones with traditional Russian patterns. We asked them what the attraction was and how other people around the town react to it. The car already had this paint job when Alexander bought it. The Khokhloma paintwork set the original owner back around 450,000 rubles (around $15,000). The car turned heads as soon it appeared on Moscow roads. These days, it is a well-known sight in the western part of town, along the Mozhaisk and Rublyovskoe highways. “For me, the big thing is the reaction the car gets from other people,” the owner says. “You should see their smiles!” And this is very important for Alexander. For a while, the Porsche was so popular that a crowd of girls used to gather around it for a photo-opportunity every Saturday. 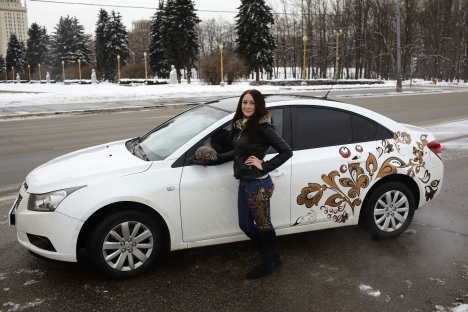 Natalya’s husband Maksim wanted to give her a present when their son was born in 2009, and he came up with the idea of having a Russian-style paint job done on the hood of her car. “Of course it’s a German car, but I wanted to make it unique and give it a Russian feel.” The first idea was something with a Gzhel porcelain pattern, but it made the car “look like some kind of teapot on wheels,” in Maksim's view. So they decided to change it to a Khokhloma pattern — not with the classical flower patterns, but a grey pattern instead, which shows up better on the white car. Maksim developed the pattern himself, and a team of artists and spray-paint specialists brought it to life. If you ask her why she did it all, Yevgenia says that she had wanted this kind of pattern on her first car — a Russian Lada. She was a student back then and could not afford to have a paint job done on her car. However, when she got her new car in 2012, she made the sketches and chose the colors herself, sticking to the classical floral color scheme. Yevgenia confesses she enjoys the idea that the paint job connects her with a classic Russian concept and sees it as emblematic of her patriotic feelings. She also had her mobile phone laminated with a Russian-style pattern and wears jeans with a Khokhloma pattern, along with a matching scarf.